Are you using LinkedIn to grow your business? The Start-Up of You, a recent book co-authored by LinkedIn founder Reid Hoffman, notes that companies don’t give you business – people do. Many of your LinkedIn connections can introduce you not only to business influencers and partners, but also refer your company to new customers. In addition to teaching you new skills, that’s what this article will help you accomplish. A personal LinkedIn profile is commonly viewed as an online resume or digital business card, and using it for that is a good start. However, you can take that further – going beyond LinkedIn’s basic capabilities – to build a more powerful means of attracting and managing your connections and professional online presence to encourage more business opportunities. The following 10 LinkedIn features and best practices will enable you to not just make connections on LinkedIn, but to leverage your network to become more visible, better engaged and armed with business intelligence that will accelerate the growth of your business. These practices are organized into three distinct categories so you can realize the synergies of their combined benefits. One point of clarity before we get started – all of these features are available with a standard, free LinkedIn account. More advanced features are available by upgrading to one of the premium accounts. Taking that a step further, one particular advantage LinkedIn has over other networking sites is its internal search capabilities. You can improve your search discovery and ranking within LinkedIn in just a few short weeks when you optimize your personal profile with the following four tips. 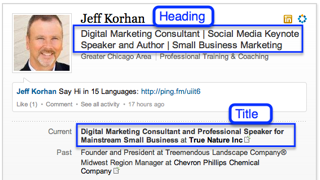 Many people consider their LinkedIn heading to be synonymous with their title, but there is a difference. Your title is indeed important for being findable for a LinkedIn search, but your heading is a valuable opportunity for extending it further by emphasizing and elaborating on your skills, areas of expertise and your ideal customers. Descriptive key phrases in headings reinforce skills and capabilities in your current title. To maximize your benefit from LinkedIn, you should consider importing all of your online and offline business contacts into it, while also being diligent about making frequent updates. Every network is a web of connections, which are known as social graphs – digital maps that lead new connections to you. When you import all of your other business contacts into LinkedIn, you not only ensure its completeness and relevance to reality, you also maximize the aggregate value of your LinkedIn network. The following video on LinkedIn Maps illustrates how this works. While tagging your skills and expertise does not presently seem to make a significant difference for LinkedIn search, this may well be the case in the future after this feature moves out of beta. For the time being, consider tags to be additional information that may prove useful for someone who happens upon your LinkedIn profile. You can add up to 50 tags to identify your specific skills and expertise. LinkedIn provides the capability to link your personal profile to up to three websites or pages, including your company website, personal website or blog. If this is done properly, you can have those links attached to your chosen keyword phrases, thereby further enhancing your search engine optimization (SEO) both within LinkedIn and on the open web. The secret is using the “other” category to enable this option. This video will demonstrate how to maximize the value of the outbound links from your personal LinkedIn Profile. You can maximize your results from LinkedIn from the moment you make a new connection. This starts with having a profile that encourages others to engage with you – one that presents you as interesting and approachable. You already know that using conversational language and having an engaging profile picture make you more personal and attractive. If you are willing to invest a little more effort, the following three tips will prove to be invaluable for opening doors to new opportunities. My experience is that few people acknowledge new connections with a personal reply, something that takes just a few seconds. This is why this strategy is so valuable for developing relationships and standing apart from others who are just collecting connections. There are two applications for adding video to your LinkedIn profile – the Google Presentations app and the SlideShare app. Having worked with both, my experience is that the SlideShare app is more reliable. If you know how to embed a video in a PowerPoint presentation, then you can easily put a video in your LinkedIn profile with the SlideShare app. You can embed the video in the first slide and set it to launch when your profile is accessed, or use the first slide to introduce the video. This video will demonstrate how to add video to your personal LinkedIn Profile. In the days before digital when we exchanged business cards at a networking event, it was a common practice to make a note on the card about such things as a particular opportunity to follow up on. That’s the purpose of this feature. If you scroll down any profile you will find a field for inserting notes. Given that many of us have hundreds of LinkedIn connections, additional information can prove very helpful for personalizing your follow-up communications. In many ways, LinkedIn is a database, customer relationship manager (CRM) and social business network all rolled into one. If you take the steps to refresh your personal profile on an ongoing basis, while also keeping all of your contacts current, you will get more out of LinkedIn than the average user. As you know, your CRM is only as good as the information entered into it – and the next actions you take to use it. These final 3 tips will help you realize the full capabilities of LinkedIn now, and especially as new features are added. Asking for a favor when you first meet someone is not smart networking. Thus, tagging your connections so that you can share useful information and build value over time is a great way to build mutually beneficial relationships that will serve you well. By classifying your connections as you add them, you will create a framework that allows for filtering them in ways that are advantageous to your networking strategy. Use tags to filter connections for higher-value interactions. One way to use LinkedIn to acquire business intelligence is to study the interrelationships of your contacts. For example, if one of your competitors is connected to your new contact, then you can use that contextual intelligence to minimize risk – just as you also can discern potential opportunities from their second- and third-degree connections. 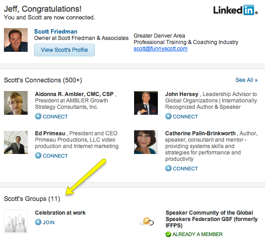 Another way to use the context of your network is for finding better LinkedIn groups. There are thousands of groups on LinkedIn, but your trusted connections can lead you to those that may be best-suited to you as a result of your contextual relationship. New connections that you share groups with can introduce you to new ones. One of the challenges of CRMs is that you have to consistently enter fresh data to derive maximum value from them. Take advantage of the fact that most of your LinkedIn connections are keeping their contact information current by periodically importing that data into your CRM. LinkedIn has a feature for downloading your connections into a CSV file (like an Excel file) that can then be imported into your CRM. If you do this at least a couple of times a year, you will always have the most current contact information at your fingertips for staying connected. LinkedIn is a network designed for professionals, one in which the individual is the center of the ecosystem. This is why taking steps to fully enhance your personal profile is the surest strategy for making the most of LinkedIn for your business. What do you think? Which of these 10 best practices will help you get more business from your personal LinkedIn profile? Leave your questions and comments in the box below.